Melissa Strong, arms crossed in the I Dream of Jeanie position, receives care from providers at UCH. Her thumbs remained attached to her forearms for three weeks. One day last April Melissa Strong crossed the natural world’s razor-thin line between beauty and destruction. Strong, 43, was working with husband Adam at their home in Estes Park on a project to renovate a restaurant they planned to open in town later in the year. Before her was an old chair that she was preparing to restore with a wood-burning process called the Lichtenberg technique. Electricity from two live leads hooked to an old microwave transformer would course through a baking soda and water solution painted on the chair’s surface, etching delicate figures resembling tree branches and rivers. By her estimate, Strong had successfully completed about 30 projects using the technique. On this day, she plugged the transformer into an extension cord and dragged the leads out to the chair in the driveway to make sure they reached far enough. Then she left to prepare the baking soda solution. Strong had forgotten to unplug the transformer. When she returned to start work on the chair, Strong picked up the two live leads. Electricity coursed through her hands and the rest of her body. A light tingling became a force that froze her hands to the leads. She figures about 20 seconds went by before she passed out. During her recovery, Strong spent time at the Fulginiti Pavilion for Bioethics and Humanities viewing the Masterworks exhibit. 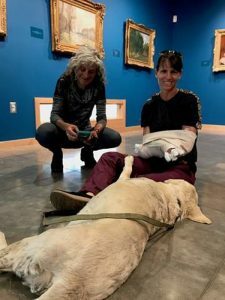 On this trip, her dog and friend Beckie Greer were companions. The electrical current produced devastating burns to Strong’s hands and seared her chest before exiting her body. She survived only because the breaker in the house tripped, cutting the deadly flow in the nick of time. Because of that, the house holds a special place for her. The accident did, however, change Strong’s life. 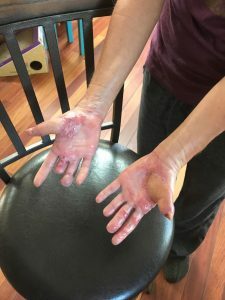 The electricity blackened and ravaged the hands she’s used for nearly 20 years as an elite rock climber who has scaled challenging stone faces across the United States, in Europe and in Australia. She’s attracted sponsors and worked to demonstrate and promote climbing that respects and protects the environment in Texas and in Rocky Mountain National Park. The future holds no guarantees that she will return to climbing. But with the help of Wagner and UCH plastic and reconstructive surgeon Ashley Ignatiuk, MD, Strong is bending her will toward recovery. It’s not hard to imagine how she might have yielded to depression when one looks at photos of Strong’s burned hands. “They were fried from the inside out,” Ignatiuk said. 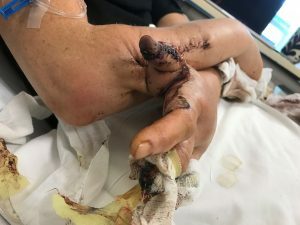 The current “blew off” the tendon of her right thumb, he said, and left very little skin elsewhere on the hands that might serve as viable material for a graft. Strong’s hands after care from the Burn Center and reconstructive surgery. She needs extensive rehabilitation but is returning to work and hopes one day to rock-climb again. But Ignatiuk credits Wagner and the Burn Center team for giving him the chance for a surgical save. Strong arrived at UCH after Adam raced her to the emergency room at Estes Park Medical Center. Her hands “looked like melted wax, charred, with pieces of pointy bone,” she recalled. Staff hastily arranged to transport her by helicopter to North Colorado Medical Center in Greeley, which was equipped to treat her burns but not to attempt to surgically salvage her thumbs. That meant an ambulance ride to UCH, where staff in the Burn Center went to work debriding the ruined skin from her hands and chest. “Early debridement means less chance of infection and gives us the best chance for a good cosmetic and functional outcome,” Wagner said. She noted that electrical injuries require a different approach than burns caused by fire or chemicals. Electricity devastates nerves and tissue below the surface of the skin first before working upward. “We don’t know the damage under the skin right away,” Wagner said. The tissue can continue to die, she explained, which makes it particularly important to resuscitate the tissue with fluids and closely monitor kidney, heart and brain function. There was one bright spot among the carnage of Strong’s injury. When nurses pricked her thumbs, they bled, at least a faint signal that they might be saved with a graft. Wagner immediately consulted with Ignatiuk, who considered what he might do to avoid amputation. Ignatiuk connected blood vessels in Strong’s thumbs to her forearms. The aim: develop a skin flap he could use to rebuild the damaged fingers. “We focused all our efforts on saving Melissa’s thumbs,” Ignatiuk said. To do that, he and his team had to identify as quickly as possible the remaining viable blood sources that would provide a base for reconstruction. He used indocyanine green, a fluorescent dye injected into the vein that lights up living tissue under near infrared lasers. The images of Strong’s thumbs showed mostly dark areas – the signs of death. But a few areas showed the light of life. But where to find grafting material? Ignatiuk wanted to use skin from Strong’s hands, but the extensive burns made for few sources. After considering other possibilities, Ignatiuk suggested what he called an “old school” solution: a pedicle flap. Rather than attempting to connect a flap of muscle and tissue from another area of Strong’s body to her thumbs, he would connect them to a blood supply elsewhere in her body. That was a daunting prospect for Strong. Ignatiuk planned to surgically sew her thumbs to her forearms, where they would remain for three weeks, receiving the blood flow needed to restore them and provide the material for reconstruction. She would be stuck in what she called a “Dream of Jeanie” pose, arms crossed, hands unusable. She would be dependent on nurses and CNAs during the period, much of which she was to spend in the seventh-floor unit of Anschutz Inpatient Pavilion 2. “They were my everyday lifeline,” she said. Strong put her trust in Ignatiuk and his team. “I had no doubt they were doing all they could and that this was what I had to do to get my thumbs back,” she said. Ignatiuk gave her his cell phone number and encouraged her to text him when she got scared or anxious during the recovery period. Friends and supporters from Estes Park rallied for her, providing important items like shirts that buttoned at the shoulders and visits to rally her spirits. Strong also found sustenance in walks around the University of Colorado Anschutz Medical Campus. One important daily stop was the Fulginiti Pavilion for Bioethics and Humanities, which at that time featured “Masterworks,” a collection of nearly two dozen pieces from Picasso, Degas, Renoir and other artistic trailblazers. The exhibit served as a point of inspiration for Strong and those who came to campus to see her. In addition to walking, Strong also pedaled the time away. A nurse told her about a stationary bike in the waiting room of the sixth-floor unit in the AIP 2. She found it and rode every day, propping her arms on the handlebars as her feet spun the wheels. When Ignatiuk finally separated Strong’s thumbs from her arms, he used the skin from the flap to build her new appendages. The thumbs carry a reminder of their source material: hair from her forearm. “I’ll probably need laser hair removal for my thumbs,” Strong said. Ignatiuk also grafted a patch of skin from her thigh and the bikini-line area to repair the chest burns that marked the electricity exiting her body. There is still work to be done. 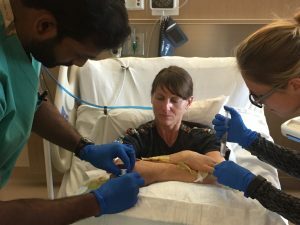 Ignatiuk performed another surgery June 30 to widen the webbing between Strong’s left thumb and index finger to improve her ability to spread her hand. He also plans to continue rebuilding the tip of the left thumb. That will require taking a vein, artery and nerves from the back of her index finger as the source material to lengthen and shape the thumb. The nerve transfer means her index finger will feel sensation when she touches her thumb. The recovery has included plenty of pain and discomfort, Strong said, but she’s now using them to lift 10-pound weights and roll metal balls in her palms . She installed climbing holds in the stairs in her home to get her fingers used to the grips. With that work, she aims to regain strength in the damaged digits. She tries to be philosophical about an injury that took so much from her. “In my mind, if I wasn’t a climber it would all be easier to handle, but I don’t know if that’s true or not,” Strong said. “You don’t stop and think about how many people’s professions are hand-based.” She thinks, for example, of the contactor and architect she and Adam work with as they continue to point toward opening the restaurant in the fall. Today Strong focuses on a future that holds promise, knowing that’s a far cry from the moment she crossed the line from beauty to destruction and knocked on the door of death. In the frightening minutes when she arrived at the hospital in Estes Park, she feared she would never climb again. Now she has her hands and a firm grasp on hope. Burn care: UCHealth Burn Center is only ABA-verified clinic in Rocky Mountain Region.